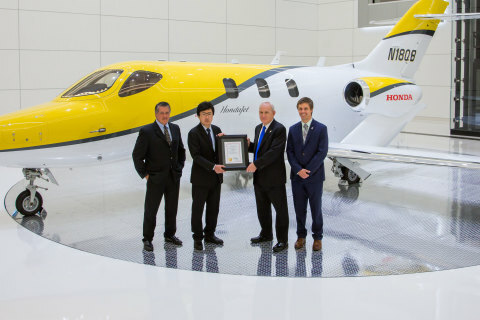 GREENSBORO, N.C.--(BUSINESS WIRE)--Honda Aircraft Company announced today that the HondaJet, the world’s most advanced light jet, received its type certificate from Transport Canada on June 1, 2017. The approval paves the way for the company to begin deliveries to Canadian registration customers as HondaJet production continues ramping up. The HondaJet is the fastest, highest-flying, quietest, and most fuel-efficient jet in its class. The HondaJet incorporates many technological innovations in aviation design, including the unique Over-The-Wing Engine Mount (OTWEM) configuration that dramatically improves performance and fuel efficiency by reducing aerodynamic drag. The OTWEM design also reduces cabin sound, minimizes ground-detected noise, and allows for the roomiest cabin in its class, the largest baggage capacity, and a fully serviceable private aft lavatory. The HondaJet is equipped with the most sophisticated glass flight deck available in any light business jet, a Honda-customized Garmin® G3000 The HondaJet is Honda's first commercial aircraft and lives up to the company’s reputation for superior performance, efficiency, quality and value. Honda Aircraft Company announced today that the HondaJet received its type certificate from Transport Canada on June 1, 2017.